First post of 2015, although a bit late. Hope you all had a good start in 2015. I would like to start my 2015 blogging year with something unusual, at least compared to what I wrote in recent times. Something still connected to Vehicle Dynamics and race cars but more on the design/conceptual side. Don’t worry, I will go back to more handling/simulation related topics soon. My Lmp2 project is still going on and I am really very happy about the outcomes. I also did some studies on the Yaw Moment Diagram during the winter and will soon (hopefully) write here about a tool I built up, showing which information we can derive from it and, in general, from the Milliken Moment Method approach. I would also like to use the model I built for my LMP2 projects to try to tackle some more Race Engineering related topics, like setup optimization and the simulator use with regards to it and the performance and handling effects of specific design changes. Anyway, let’s go back to the original topic of this article. As you may have seen, my interest has been focus, in the last years, mainly on LMP vehicles. I think they are extremely interesting, both the “small” teams cars (see LMP2) and the LMP1 from the big Manufacturers. Moreover, I really think that endurance racing can be extremely exciting, although its “long time” format. If you then add to all of it the freedom that technical rules the teams have (above all in LMP1), you can easily figure out why I like it so much. Some time ago, an interesting picture of a (very expensive) 1:8 scale model of Porsche 919 Hybrid (LMP1) popped up in Mulsannes Corner Facebook group and me and some other guys had an interesting discussion about the suspension layout that Porsche uses at the rear (and probably also similar, conceptually, to the one used at the front) for their LMP vehicle, since some details about it could be understood looking to the model’s pictures. Unfortunately, I didn’t find any other good picture to share and to use to show how the real thing looks like, a part from the one relating to the mentioned scale model. 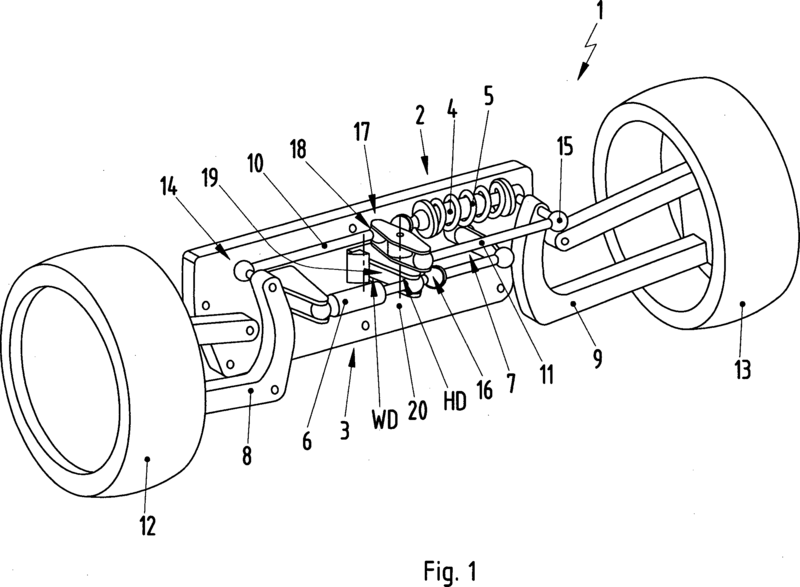 Anyway, the discussion became really interesting when a user posted a link to a Porsche patent about a specific suspension scheme; this patent could well be connected to their LMP1 vehicle suspension layout. Unfortunately (but not surprisingly), it isn’t showing exactly how the LMP1 suspension looks like, but something which is nonetheless very interesting and, maybe, similar (again, at least conceptually) to what they are using in their 919 Hybrid. 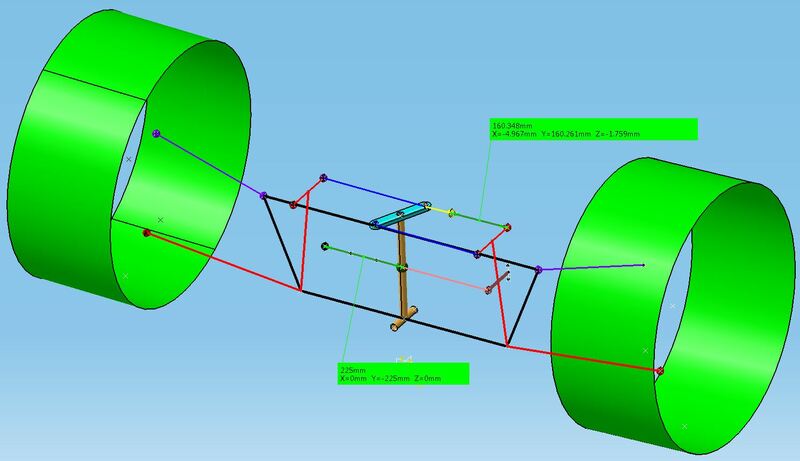 The most interesting point about this scheme is that it should allow a completely decoupled control of Roll and Heave motions, both from a stiffness and a damping perspective. People out there involved with race cars (in particular with single seaters, see F3) could probably say that, up to a certain point, something similar can be achieved also with a traditional pushrod layout (using a T antiroll bar and a Third Spring), or with a F1 style suspension geometry, with Torsional Springs mounted on rocker pivots and a third element in between them. In both cases, you could (at least theoretically) use the third spring as the only vertical elastic element and the antiroll bar as the only roll elastic one (that means taking out corners springs or, in case of the F1 style layout, another chance could be to ground the torsional springs together and not to chassis). In both cases, the heave damping could be provided mainly from the third element damper unit, while the roll one could be produced by the corner dampers. A very interesting concept with similar enhancements was also used by Peugeot in their 908. It also had some similar features to what shown by Porsche in this document (see a central watt linkage and an antiroll bar made out mainly of a “blade”). 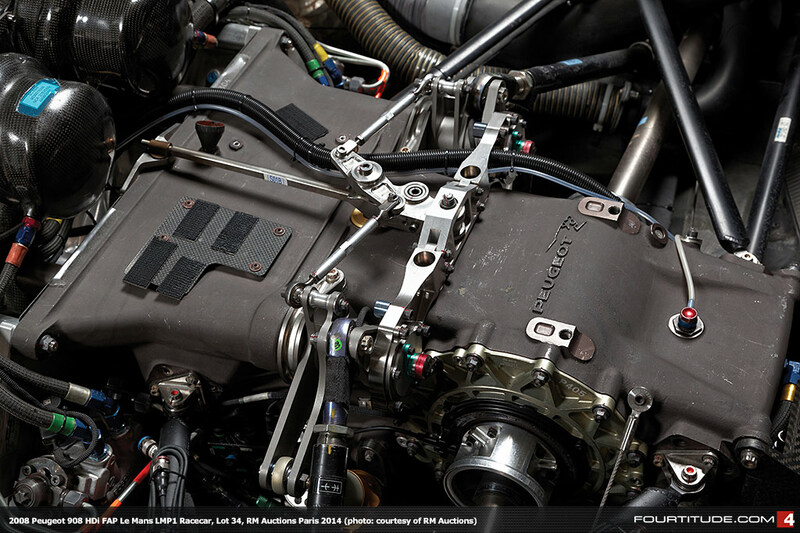 The picture below show a situation where Peugeot didn’t use any third Spring/Damper unit, but there is clearly the possibility to mount it, if needed; another picture in Mulsannes Corner website clearly show where and how it could be mounted. Peugeot concept still uses two corner dampers, though; and probably, corners torsion springs. Beside the “duplication”, cost and weight effect connected to having one damper more in your layout (and, probably, the possibility to easy interconnect front and rear suspensions, but that was something that also a “more conventional” solution could offer), there is also another pure vehicle dynamics related point that could made a system like the one from Porsche very interesting: you have a completely decoupled control on roll and heave from both damping and stiffness perspective. That means that you can tune your roll stiffness and roll damping in a totally independent way and that you can, potentially, overcome an issue connected to “traditional” layouts and roll damping. And you can do that, with two dampers only. If you use a “normal” layout with two corner dampers or also, eventually, a third element consisting of a spring (linear or not, see bump stops for example) and a damper, acting on your corner dampers, you would anyway produce an effect on both vertical and roll damping; normally, moreover, (at least in my experience) with such a design, your roll mode is normally overdamped. That’s happening because the roll inertia (at least in single seater and sport cars, I don’t have enough experience on GT and Touring cars, but I would expect the same) is typically low, compared for example to Yaw and Pitch inertia. That would require a very low damping rate, to achieve a Roll Damping Ratio below 1 (I will later on expand on the question: is it really necessary?) more or less in all of the roll stiffness range; but that is normally conflicting with the damping rates that you want in your corner dampers to have an “optimal” heave damping. As I said, the situation could be mitigated in a “normal” race suspension’s three elements layout keeping the corners damping very low and using the third damper to increase vertical damping sensibly. But still, beside the need to use a third damper, increasing costs, weight and, although maybe only slightly, CG height, in my experience you could still find yourself not being able to use “low enough” roll damping ratios, without going with unrealistically low damping rates. One aspect about Porsche’s concept that still makes me think is the roll damper motion Ratio, though. But we will go back to the point later. Let’s now take a look at how the system shown in the patent could actually work. To better understand the kinematics, I built a similar suspension layout in CAD and did some motion simulations. I assumed, for the time being, a pure 2D mechanism for the wheel motion: that means that the wheel path lies in a plane perpendicular to the longitudinal axis of the car (normally x axis). This should not take away any generality to the study, taking also into account that the scheme we are analyzing (the one shown in the patent document) is not the one really used in the car. Part n.1 and n.2 (Red and purple lines) are representing lower and upper control arm respectively. Part n.3 (Black line) is vehicle’s chassis, parts n. 4 are drop links connecting the Lower Control Arm protrusion to the elastic elements. In a pure heave motion, they activate a Watt Linkage (part n. 5, light blue) which is free to rotate around a vertical axis, defined by a yellow vertical bar (part n.6) which is free to sway around an orizontal axis. Between one side of the watt linkage and one of the lower control arms protrusion seats a Spring/Damper unit, working only in Heave (part “A”, initial length 225mm). On the other hand, the yellow vertical bar activates, when moving (it sways about its orizontal axis pivot only in roll) a “roll damper” (part “B”, initial length 225 mm) and, through a drop link (part n. 7, orange) an antiroll device, directly mounted on the body (part n.8, brown). In a pure heave motion (both wheels moving up with respect to the chassis, or the chassis moving down compared to the ground/wheels without rotating), the vertical bar (part n.6) doesn’t sway, but the watt linkage rotates about its vertical axis and let the “Heave Spring/Damper” unit (part “A”) to compress or extend (as shown in the following picture), where its length reduces to about 160 mm. In a pure roll motion, the watt linkage doesn’t rotate and the “Heave Spring/Damper” unit is not active. The complete upper part of the system moves rigidly and no elastic/damping element is involved in any motion in this area. The Vertical Bar (part n.6), anyway, sways about its pivot and activates both the roll damper unit (Part “B”) and the antiroll bar (part n.8). 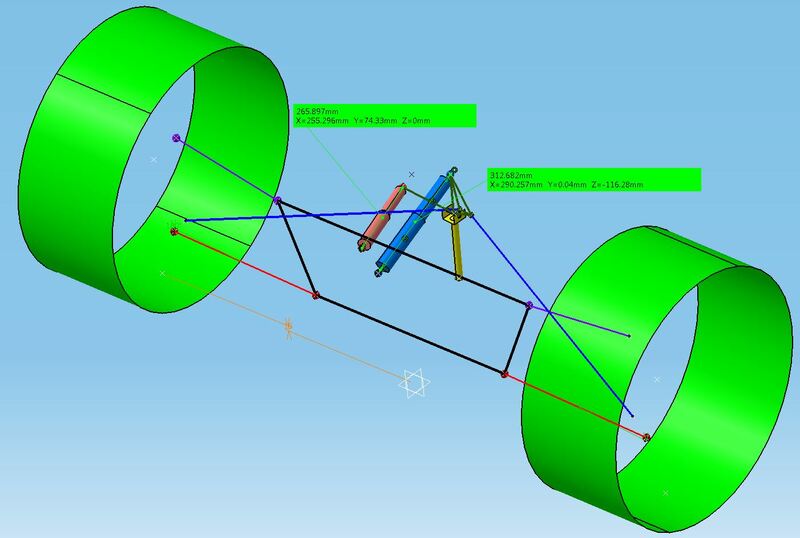 In the picture below, the first has now a length of …mm (the simulated roll motion is pretty big, about 50 mm wheel motion per side or about 3.6 degrees; that shows where my concern about the roll damper motion ratio come from, although this point could be maybe somehow overcome). It is very important to notice that “roll” is here meant as a pure body rigid rotation about the roll axis, also taking into account how the roll axis move as the wheels displace. 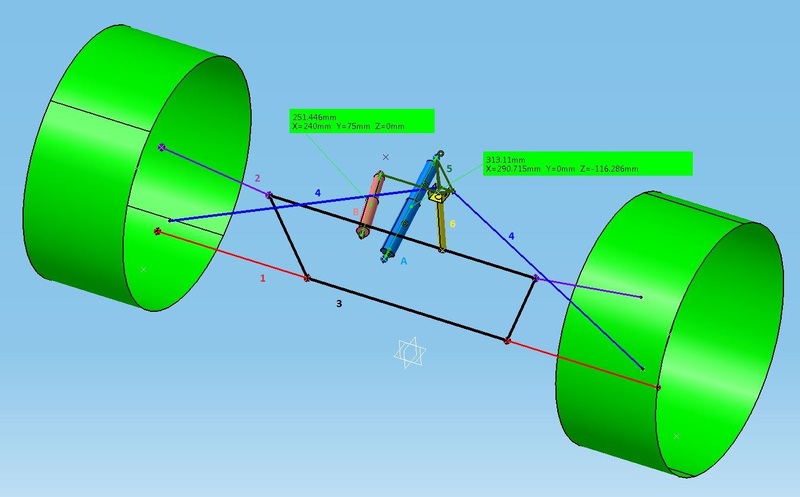 In our simplified simulation, we are considering a pure plane mechanism (as I said, the wheels move on a vertical plane perpendicular to the car longitudinal axis), so the roll axis collapses on the roll center. The CAD scheme I drawn is slightly different than the one shown in the patent and, actually, the antiroll bar element (part n.8) could be easily replaced by a torsional spring placed at the base of the vertical bar (part n.6) and laying horizontally, so that when it rotates about its horizontal axis, an antiroll action takes place. It is anyway clear that such a system would allow a complete decouple of Roll and Heave control. On the other hand, it would be interesting to know if and how Porsche had managed to solve the roll damper motion ratio issue I mentioned before. Next question would be: is it really necessary/beneficial to reduce roll damping so much, compared to a “traditional” suspension layout? From a pure mechanical perspective, an over-damped roll motion (as we normally have in roll in Race Cars) should make the “system” response slower, delaying the “steady state condition”, if one really exists. I never had a chance to really test such a low roll damping, unfortunately. As far as I know, anyway, many drivers don’t like a too “soft” damping in roll, because they normally perceive a “lack of support” with such a setup. Anyway, with a system like Porsche’s one, there would always be the possibility to increase roll damping as much as we want, still keeping the chance to adjust it independently. It would also be interesting to understand/test/simulate how the tires and the Yaw response of the car would react when reducing roll damping. Theoretically, the yaw response to a step steering input, for example, should be quicker, but it would be interesting to do some tests or to perform some simulation to evaluate if this is really the case. It could well be the topic of another post! We could now maybe try to imagine how the real thing looks like. Unfortunately, as I said, I found no picture really showing the real rear suspension, so I am really guessing here. It uses, of course, a “normal” pushrod actuation, in place of the simple scheme depicted in the patent, where the elastic elements are activated directly from a protrusion of the lower control arm. As I said, I have no way to be sure that what I sketched up really resembles what Porsche actually has on its car. Anyway, what you see in the following picture should, at least conceptually, (more or less) ensure the same functional behavior of the system described by the patent. Again, we have a lower control arm (part n.1, red) and an upper one (part n.2, purple). 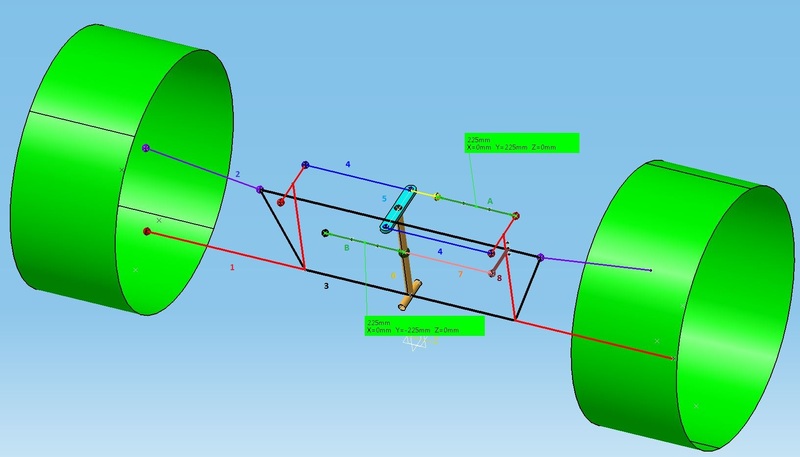 They are attached to the chassis (part n.3, Black) and determine, in our simple simulation, a pure 2D wheel motion (the wheel center always lies in a plane perpendicular to vehicle longitudinal axis). 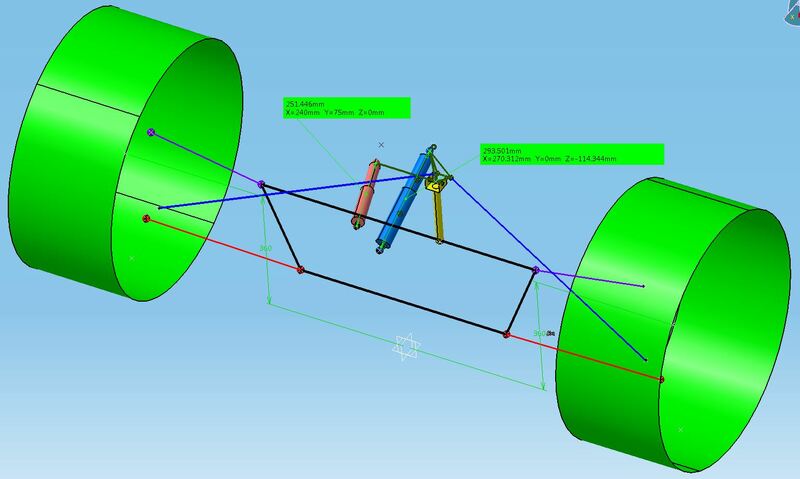 The Pushrods (part n.4, blue) are forward inclined and connect to a rocker (part n.5, dark green) which somehow resembles the design used in monoshock suspension layouts, like on front suspensions of the old Formula 3 or Junior series, as Formula Renault. And it also produces a drawback typical also of monoshock suspensions (more about it below). The Rocker is bolted to a support structure (part n.6, Yellow) that also works as antiroll bar. It can actually freely rotate with respect to this vertical support around an horizontal axis, activating the central Heave Spring/Damper unit (Part A, Blue) in a pure heave condition. In a pure Roll Condition, it activates the rotation of Part n.6 (Yellow) which also acts as a torsional antiroll bar. The rocker is also connected to the Roll Damper (part. B, Light Red): whenever the antiroll bar vertical tube twists, the roll damper is also changing its length. in roll, this concept shows the drawback I mentioned before, since in a pure roll situation, the heave damper is interested by a very small motion as well. As I said, this is an “issue” we would also find in a Monoshock suspension, where a slider translates in roll. Actually, the displacement we measure on the heave damper in roll is pretty small (about 0.5 mm for a wheel displacement of about 15 mm per side or a body roll motion of 1 degree, which should be pretty big for such a car; remember here we only consider body motion, any tire deflection involved) . As I mentioned, the main issue I see with such a design (and that something I noticed also when I first noticed when working on a similar concept but applied to a Pushrod with T antiroll bar layout) is to let the roll damper motion to move “enough” in normal working conditions (so to build in a favorable damper motion ratio). 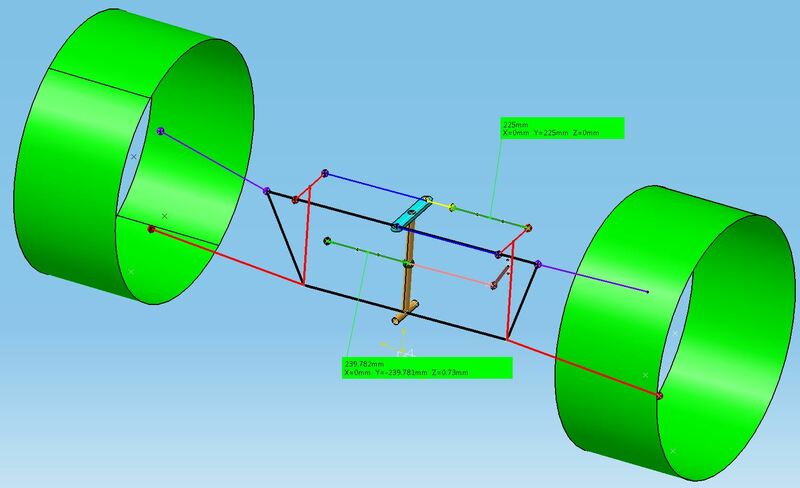 That is why, in my pictures, the portion of the rocker connecting to the roll damper is so long: the goal is to let the damper to move as much as possible, within given package constraints. I would be curious to see how Porsche managed this point and, in general, to take a look to their design! But I think they are not so keen to show it! As I said, I have no proof that Porsche actually uses a similar concept for their LMP1 car. I have too less information and picture to be able to show other than guesses, here. The one I proposed is just one of the possible solution they could have developed. It would be nonetheless interesting to test how such a concept could work on the track. I independently came up with watts linkage control back in 94 after watching Porches racing! I still have the working model in my tool box. So it is fascinating to read your blog.